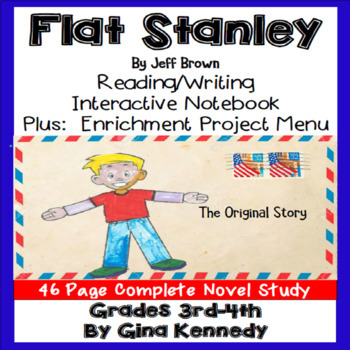 No-Prep novel study for the bestselling "Flat Stanley", a standards based interactive notebook literature guide with follow-up reading response questions for every chapter as well as vocabulary, writing projects, activities and enrichment projects. 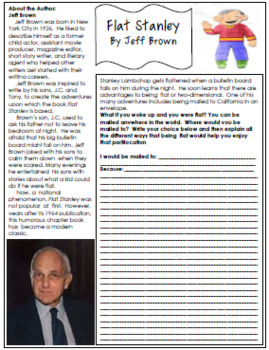 Teacher friendly engaging lessons to use with this award winning novel by Jeff Brown in your classroom while encouraging critical reading skills. 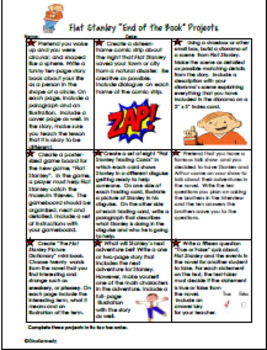 Everything you need to use this novel in your classroom effectively is included with this resource. 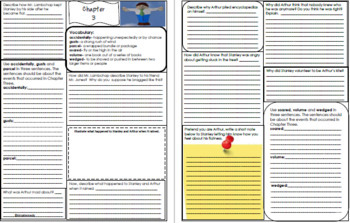 This novel study includes at least ONE PAGE OF READING RESPONSE QUESTIONS FOR EVERY SET OF SET OF CHAPTERS!